Brush both sides of the tortillas lightly with canola oil or spray lightly with an oil atomizer. Sprinkle lightly with a pinch each of salt and chili powder. Line two baking sheets with parchment paper. Put the tortillas on the sheet and bake for 3-5 minutes on the first side, or until crispy and golden brown. Then turn them around and bake on the second side for another 3-5 minutes. Remove from the oven and allow to cool. Place all of the ingredients into a food processor and puree until smooth, scraping the sides of the bowl with a rubber spatula as needed until fully combined. Transfer to a bowl and cover with plastic wrap (onto the surface) until your ready to use. Heat up a teaspoon of the oil in a large skillet over medium high heat. Add in the beans, cumin and chipotle, and stir for 1 minute. Pour in the broth, and cook for another 3-5 minutes, smashing the beans slightly as they soften. Take the pan off the heat and stir in the shredded chicken until warmed through. Taste, and season with salt and pepper as needed. Mix together the yogurt, lime juice, zest, pineapple juice, sugar, salt and pepper. Then toss with the cabbage, jalapeno, onions, cilantro and pineapple. Toss well and set aside until ready to use. 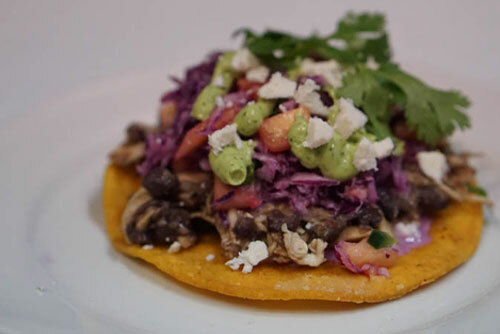 Divide the black bean and chicken mixture between the tostadas, top with the slaw, a drizzle of the avocado crema, a sprinkle of the cheese and a few cilantro leaves to garnish.